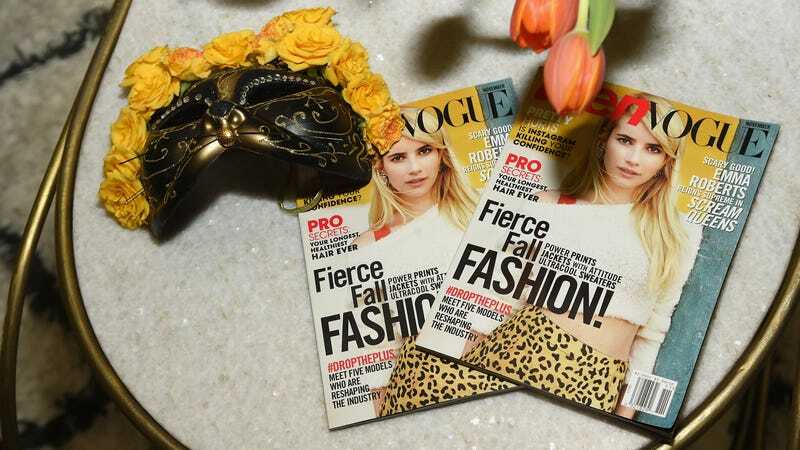 Condé Nast announced Thursday that Teen Vogue will no longer run in print, WWD reports, part of overall budget cuts and cost-saving measures implemented across the company as more of their publications pivot to digital. For a publication whose aim seems to be reaching swaths of young people interested in politics and fashion and makeup and culture at the same time, going digital-only seems like it should’ve happened a long time ago. Speaking during Adweek’s Elevate summit, Welteroth said that Teen Vogue’s digital traffic has grown from 2 million to 12 million unique users. In addition to this bump in digital attention, it was announced in September that Teen Vogue will hold a conference in early December, ostensibly for teens and young adults to empower themselves via keynotes, workshops, and panels for the low, low cost of $249 per day. Maybe no one wants to read magazines anymore—just attend conferences, network with like-minded (rich) teens, and surf the web.